Charming 4 bedroom, 2 bath raised cottage just steps from the Gulf of Mexico. Witness amazing sunsets and gulf views from the deck, with covered and uncovered areas. Fort Morgan has sugar white beaches and blue-green water. 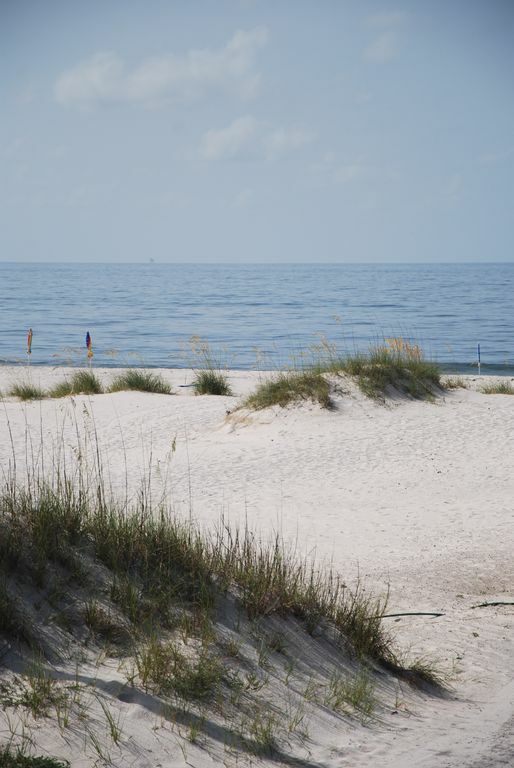 Enjoy the privacy of the beach, take walks or hunt for seashells, or enjoy the many activities in the nearby Gulf Shores and Orange Beach area. Watch the dolphins swim by, and soak in the sun and unspoiled beauty of this area. No condos nearby, small crowds. No smoking and no pets. This cottage is perfect for a family looking for a beach vacation getaway. The lot is large, and there is plenty of room to spread out outside. There is a large partially covered deck that provides the perfect spot for morning coffee, eating meals outside, or just sitting and enjoying the breeze off the Gulf and listening to the sound of the waves. Cottage has four bedrooms and two baths and an enclosed hot/cold water outdoor shower. Queen sized sleeper sofa and full sized futon, together with bedrooms, provide sleeping space for 12. Kitchen is fully stocked with coffee maker, toaster, blender, food processor, griddle, and plenty of dishes and serving pieces. Our family has owned this quaint beach cottage on the beach at Fort Morgan for almost 40 years. It is our home away from home, and we are always pleased to be able to share it with our guests so they can experience the relaxing and beautiful beaches of Fort Morgan. We are "locals" who live about an hour away, and take pride in personally maintaining and overseeing our beach cottage for our guests. Our family beach cottage is not fancy, but it is clean and comfortable. Our family has made lots of great memories here over the years, and we hope that yours will, too! Great view of the Gulf of Mexico from the deck of the cottage with easy unobstructed beach access. Close enough to hear the waves! Wi-Fi is available in the beach cottage. Password is provided on the modem/wireless router in the living room of the cottage. Smart TV in living area. In addition to the regular refrigerator in the kitchen, we have a full sized refrigerator in the room under the house that's perfect for storing drinks, frozen treats, and anything else. Our kitchen is well stocked with an abundance of dishes and utensils. Seating at a table as well as around the kitchen bar. Smart TV in living area. Small smart TV in master bedroom. Miscellaneous card and board games available for renter use. Miscellaneous beach toys are available for your use. They are stored in the storage room under the cottage and will vary from week to week/renter to renter. Large covered deck upstairs, as well as uncovered porch area upstairs. Area under the cottage has decking and is also a great outdoor area. Large corner lot with plenty of outdoor space for activities. Property is just steps away from beautiful beaches. Our cottage also has a nice covered area under the house with a picnic table and porch swing, as well as a fully enclosed outdoor shower with hot and cold water. We also provide a small extra refrigerator in the storage room under the house that's perfect for drink storage and other food items you might want to have available outside such as ice cream. Speaking of ice cream, during the summer months the ice cream man usually comes by at least once, sometimes more than once, a day for a fun summer treat! The house was as described. Our two families totaling 7 people were very comfortable and had lots of room to stretch. The storage room under the house had boogie boards, beach chairs, sand toys and games which we enjoyed. The house was so comfy that we ended up eating in more, than going out. We grilled burgers and shrimp outside-yum! The towels were nice quality and there was ample bedding and blankets. The house sits back from the beach but we had a full view from the deck--the dolphins were fun to watch! The beach was very clean, lovely white sugary sand. The surf was a bit rough but that didn't deter the teenagers from jumping in and enjoying the waves. Thanks for a lovely stay! We enjoyed having you as our guests and hope you will return. So glad you had a good time! This house is a quaint, vintage cottage with very easy beach access. It is clean and very homey with a well equipped kitchen. I liked the fish cleaning sink downstairs, since we always fish. The refrigerator downstairs is also very convenient for bait, ice, and beverages. It seems that the owners have tried to think of everything tenants might need to enhance a beach experience. The first ever Fort Morgan Mardi Gras Parade marched by on Sunday, which was an unexpected treat! I highly recommend this house! We 4 ladies felt like we were home. The view of the beach and water from the deck was awesome. We loved the walks on the beach. It was quiet and peaceful. Yet only 20 minutes to major attractions, parks, great food and shopping. We loved Sassy Bass just minutes from our beach house. I hope to come back. I recommended it to friends and family. We are so glad you had a great time! Thank you for choosing us for your beach trip and we hope you will return. Beautiful views. Loved listening to the ocean while relaxing at house. Very nice and clean home. Home owner was very communicative and approachable. Would definitely stay again. We're glad you had a great time! We loved this property. House is clean, comfortable, adjacent to beautiful endless beach for walking or surf fishing. Quiet neighborhood was perfect for walking too. Sassy Bass restaurant serves delicious meals only a mile or two away. Karen was responsive and friendly and answered all of our questions about the rental prior to our arrival. We are planning to rent this home again in 2020. We are so glad you enjoyed your time at the beach and we look forward to having you as our guests again next year! Cool outside but warm and cozy in the house. Great time other than the weather. We really enjoyed the house and found it to be very homey. If it weren’t for the house we would have struggled to have a good time because of the weather. House was great and had everything we needed. The hosts contacted us before we got there and were very gracious. We ate at the house twice a day and had plenty of dishes and cooking wear to meet the needs of our eight family members. We would definitely stay there again and come during a warmer part of the year. We all agreed we would highly recommend this place for a comfortable stay to anyone. Thank you to Karen and John. We hate that the weather was not better during your trip, but are glad you enjoyed your stay. Please come visit again.